James has spent the last month and a half telling me that he's four years old. And before that he was proudly three. When I accidentally slip up and say that he's three he is quick to correct me. "That's not my number!" He says loudly. "Mama. That's not my number! I had a birthday, remember?" His voice lets everyone know that he is clearly horrified that I could possibly forget even though I haven't, he simply hasn't been four all that long and I've simply slipped into saying "three" again. As we were walking through Walmart yesterday, picking up the last few presents that I needed to complete my Christmas shopping for the kids, he said "hi!" in a friendly voice to every single person we passed from his seat in the cart. An older woman stopped in the Christmas light aisle and struck up a conversation with him while I was picking out lights to drape across the bushes in the front yard. "Well hi!" she said in a voice that made me wonder if she was retired kindergarten teacher. After a few moments of banter she said "And how old are you?" James smiled wildly and then I heard the words that completely shocked me as I picked up a box of lights and turned them over in my hand, trying to estimate how many I would need to cover all the bushes. "You don't... know?" She sounded taken aback. Obviously this child looked like he should be old enough to know how old he is. "How old you are buddy? You're always telling me. You can tell her. You just had a birthday!" I smiled encouragingly. Wondering if our gregariously friendly child was suddenly taking after his big brother and feeling shy. Then I caught the look in his eye and realized that he wasn't. "Nope. I don't know. I just don't know how old I am." "You don't know how old you are?" She repeated again. "Sure you do!" I looked at him encouragingly. He smiled back innocently. "Nnnnmmmm. No. No idea." The child who earlier this morning had stroked my face and spontaneously told me I was a "clever genius" for helping him get dressed, who had been complemented by all the members of Sadie's IEP team for being so articulate an hour earlier, as he answered questions with words like "exactly!" and "actually..." and called me "my lady" when I buckled him into his carseat when we'd left for the store, was apparently up to something. He loves telling people is four. He does it constantly. "Doesn't know his age?" I heard the words murmured. "Okay, I can help, you're this old!" I held up four fingers. The child can count. Not only does he know his age but he regularly holds up four fingers to show that he's four. "I don't know what that number is." He said sadly, laying it on thick. "Anyways, he's four, although apparently he's a little bit shy about saying it today!" I said sheepishly and we departed the light aisle with four boxes of shrub covering lights, leaving behind a woman who was thoroughly convinced that James had no idea of his age and probably that I was a little bit crazy, since I seemed to so completely believe that he did. As we went to pay for the items we were buying he handed the cashier an ornament and asked if he could please have it back to hold after she scanned it. He thanked her and explained that it was an ornament of his birthday month, October. "Do you know the day?" I asked, as I loaded bags into the cart. "Yeah Mom, my birthday is the 13th," he shrugged. No big deal. I raised my eyebrows as we walked out to the car. Shopping with James. It's sometimes exhausting. But it's never boring. 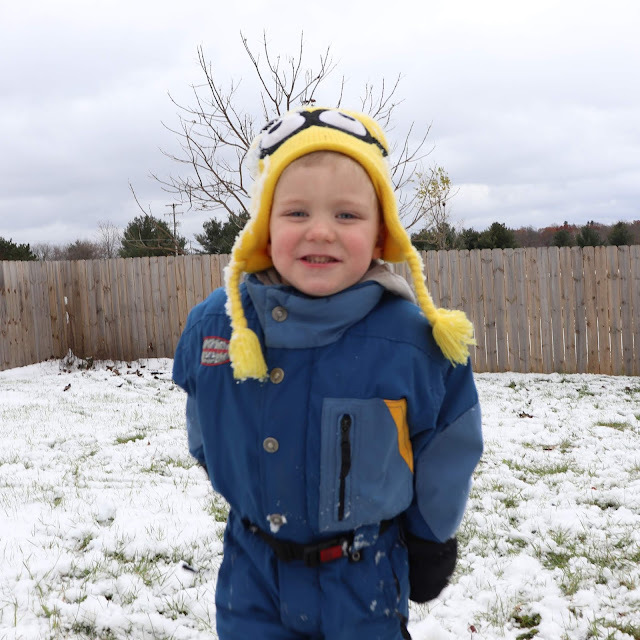 And in video news, we had our first snow day and it was fun! Thankfully Maggie was feeling well enough to join the other kids for the fun! That is hilarious! My kids did the same kinds of things, so I can completely relate.